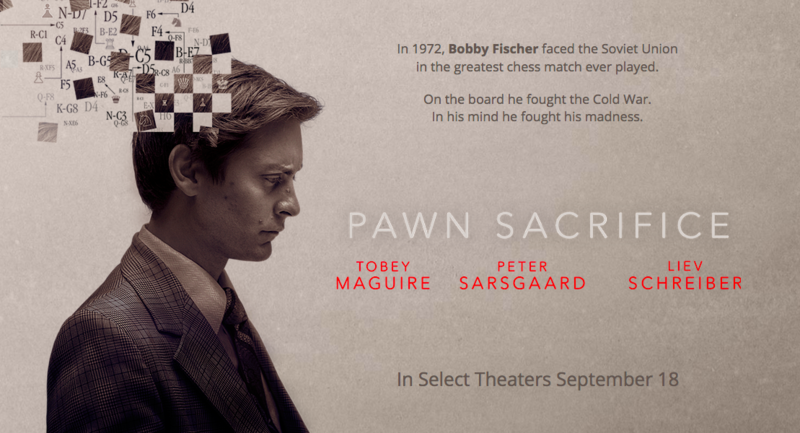 I’m declaring the riveting and flawless Pawn Sacrifice (the story of chess prodigy Bobby Fischer, played with acting genius by Tobey Maguire) the best film of 2015. This film has it all: high drama, low drama, human drama, international intrigue, unbeatable odds, fierce competition, poignancy, USA vs. Russia, an alternately elegant and rockin’ soundtrack, issues of mental health, and one of the most realistic screen priests ever enacted. Here’s hoping it will not be overlooked during awards season. The engaging trailer convinced me I needed to see this slice of Cold War history that I knew very little about (I would have flamed out on a “Bobby Fischer” Jeopardy category). I also dearly love playing chess, and am always interested in how priests and nuns are authentically captured (or not) by Hollywood. Bobby Fischer, born in 1943 in Chicago, raised in Brooklyn, New York, was of Russian-Jewish descent. His mother had Communist leanings, and raised him and his sister by herself. At a young age, his giftedness for chess became apparent, as did his obsession with the game. The film doesn’t start us off with Bobby and a chessboard, but rather his milieu, the news of the times and a crisis point in his adult life. From there we flashback and proceed chronologically, with never a dull moment, which is quite an accomplishment since we’re talking chess here. How do you make a film about a “sport” where two people sit in taut silence? Chess makes golf, tatting (lace, not ink), and croquet look positively vertigo-inducing. Through skillful angles, edits, pacing and a masterful layering of multiple sights and sounds (without ever being too busy), and some of the most mature dialogue in recent memory, the filmmakers succeed effortlessly and with aplomb, and never hype it up just to get and keep our attention. “Bobby has problems,” says Fr. Bill Lombardy (Peter Sarsgaard)–Bobby’s trusted friend, fellow chessmaster and chess fanatic–when approached by a U.S. government operative, Paul Marshall (the lost-deep-in-the-role Michael Stuhlbarg), posing as a lawyer/agent who wants to use the apolitical Bobby as a “pawn” in the “war of perception” with the Soviets. Fr. Bill becomes aware of the “lawyer’s” true identity, but it’s never clear if he informs Bobby or if Bobby becomes aware on his own. (Fischer is portrayed as paranoid anyway, thinking he was being spied on by all sorts of entities–and he might have been partially right, of course.) In the film, Bobby also suffers from acute hearing and an autism-like sensitivity to sound, especially when preparing for or playing a chess game. Bobby plays into the hands of both the Americans and the Russians, because ever since he was a child, he wanted to play the Russians, the best in the business. But although Marshall is trying to use him (and the degree of deception is unclear), Fischer was, in actuality, doing what he loved, what he wanted to do. Known for his ego, arrogance, ambition and erratic behavior, Fischer was smart enough to demand a monetary cut of what everyone else was making off his fame. He also demanded conditions that would favor his peevish powers of concentration. There’s one marvelous scene (and the filmmakers could have given us more than one of this type of scene but wisely refrained) where Fischer verbalizes the narrative of the battle going on on the chessboard. Which is really and truly what is happening. If you play chess at all, you know this. In general, the filmmakers went nice and light on all kinds of chess metaphors they could have burdened the film with. The candy-ingesting, cigarette-smoking and not-beyond-profanity-using Fr. Bill is pretty much always there to encourage Fischer and make sure that he is not wholesalely exploited. What does Father get out of this? He loves the thrill of the chase as much as Bobby. But he always sees him and treats him as a person. However–and this might sound strange–he protects Bobby as a chess player first. He knows that “without chess, Bobby is nothing” (meaning Bobby thinks he is nothing without chess). The mutual understanding between Fischer and Lombardy is really what Fischer needed more than anything, but of course, in the film even friendship was no match for the ravages of Fischer’s increasingly manifesting mental illness. He was the purest of purists, and refused to be detoured by fame, money, politics or any other considerations. There is so much that is humanly triumphant about this film. Sarsgaard’s inhabiting of a sardonic, taciturn, wry, serious-minded and self-possessed priest who is nonetheless completely at ease in the world is just grand. I know priests like this, and I hope you do, too. Like the “based on a true story” films A Perfect Storm and American Sniper, I really had no idea of the final outcome of Bobby Fischer’s story. The Epilogue is arresting and poignant. The issue of mental health looms large in Pawn Sacrifice, and is treated with great delicacy, compassion and forthrightness. It’s a contest the film imagines Bobby didn’t win, but one he never stopped fighting.